Created in Saint-Tropez in 1955, the Tarte Tropézienne is a round brioche filled with orange-scented diplomat cream and sprinkled with pearl sugar. It was only known to locals until the heavenly Brigitte Bardot breezed into town. On location during the filming of Roger Vadim’s subsequently scandalous Et Dieu… créa la femme (And God Created Woman), she tasted the cream-filled brioche, and the rest, as they say, is history. Patented as La Tarte Tropézienne in 1973 by its creator, Alexandre Micka, the pastry only recently became popular in Paris. Now you find them all over the city: in the Carrousel du Louvre or in the Saint Germain area. If you’re around metro Odéon, you can sample a Tropézienne tart from another brand, La Maison Sénéquier (better known for its nougat), at Le Hibou. True to the original style of serving the tart, the portions are generous enormous – perfect for sharing. What’s the secret of the patented Tarte Tropézienne? If you ask one of only three people in the world who know the secret, they won’t tell. Is it that Micka developed the recipe based on his Polish grandmother’s brioche tart? Non. On its web site, La Tarte Tropézienne is described as being filled with “two types of cream.” The first is pastry cream, and the second is whipped cream. But the real secret ingredient (and the tart’s success) was revealed to me by two pastry chef friends from Brooklyn when we sampled it together this summer: there’s a bit of gelatin mixed in with those creams. And any pastry chef will tell you that when pastry cream is combined with whipped cream and gelatin to set everything up, you get a diplomat cream. In a former post, I showed the kissing cousins of béchamel sauce. Here you can see that pastry cream is a kind of “mother cream” whose secondary creams are also delicious – many of them lighter than the basic cream. So the real secret to the diplomat cream and the tart’s success is the tiny bit of gelatin in the filling, without which the tart would surely melt and ooze in the hot Saint Tropez sun. Now at the heart of a booming enterprise, La Tarte Tropézienne’s brand encompasses a beach club and a catering unit. But back in Paris, the Tropézienne might mean something else entirely. Because some parisiennes tend to care more about (or at least as much about, in my case) fashionable footwear than an ephemeral pleasure like a brioche tart, Les Tropéziennes is more well-known as a brand of shoes. You want sweet? They meant sandals. Oh, well – at least in Paris, you can have your Tropézienne and eat it too. 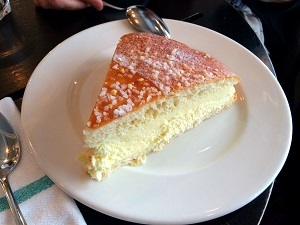 You can find the Tarte Tropézienne in Paris at the Carrousel du Louvre and in Saint Germain des Prés. If you’re elsewhere in France, click here to find addresses in the Var, Nice, Aix en Provence, Marseille, Bandol, and even in the Savoie. Warning/disclaimer! If you love brioche but don’t want to make the Tropézienne brioche tart, this brioche recipe from La Tartine gourmande is delicious on its own, but it does take some time to make because of the different stages of rising/proofing. However, this recipe in its entirety should only be attempted if you have some significant experience with baking and making French desserts – or better yet, a pastry chef friend who can help you. •	This recipe is really only possible with a good digital kitchen scale. I have a scale from Terraillon which measures in grams AND in pounds and ounces – I use it every day. You can buy either a cheapie one or “The Best” one). •	Because it will set up quickly with the gelatin, the diplomat cream can only be made once the brioche is finished cooking, but you can measure out all the ingredients while the dough is rising. •	All your ingredients should be at room temperature, except the milk, which should be warmed. •	This makes a very big brioche tart – enough for 8-10 people. If you want, you may divide the brioche in half after the first rise, proof the two disks, bake them, and cut the diplomat cream recipe in half. It’s easy to eat the second brioche as is, or to freeze it! 1. In the bowl of a stand mixer, gently mix the flour and yeast with a small whisk. Using the stand mixer with the dough hook, turn on to low speed, and slowly pour in the warm milk. 2. Add the sugar and salt, and then increase the speed to medium. Slowly add the softened butter, a little at a time, making sure each addition is fully mixed in before adding more. Add one egg, continue to mix until it’s fully incorporated, and then add the other. Increase the speed slightly if necessary to make sure everything mixes, and stop once or twice to scrape down the sides if the bowl. Continue to let the dough hook turn on medium speed for 10-12 minutes, or until the dough begins to detach from the sides of the work bowl and form a solid ball. 3. Scrape the dough down from the hook. Leaving the dough ball in the mixer bowl, cover it with a slightly damp tea towel, and let it rest in a warm place for 2 hours – it will at least double in size, if not more! 4. Work the dough again with the stand mixer for 10 minutes at medium speed. The dough should deflate and look about the same size as before it rose. 5. Lightly flour your hands and turn the dough out onto a large baking sheet (or divide the dough in half – see notes above). Flatten it out into an 8-inch (20cm) round disk with your fingers, tucking in the sides a bit here and there to get a round shape. Let the disk rise again (this is the last rise, called proofing) in a warm place for another 1 hour. 6. Preheat the oven to 400°F (200°C). Mix the rest of the milk with the egg yolk and the sugar, and brush the top of the brioche with this mixture. 7. Sprinkle the pearl sugar over the top, and bake for 10 minutes, then lower the oven to 350°F (180°C). Continue to bake for 10 minutes. Remove the brioche from the oven and let it cool for about 5 minutes on the pan, then transfer to a wire rack to finish cooling completely. 8. To make the diplomat cream, bring the milk to a boil in a medium saucepan over medium heat. Remove from heat. If you’re using powdered gelatin, bloom it in 1 tablespoon cold water. For sheet gelatin, soak it in a bowl of cold water. 9. Meanwhile, combine the egg yolks and sugar in a medium bowl, and whisk until pale. Add the flour and cornstarch and whisk again to combine, scraping down the sides of the bowl. Pour the milk into this mixture, whisk well, and pour everything back into the saucepan. 10. Over medium-low heat, cook this custard, stirring constantly, until the mixture boils. Keep stirring and boil for 2 minutes. Remove from heat and add the gelatin, stirring well with a whisk. Once the mixture has cooled, add the orange flower water. 11. Whip cream to stiff peaks. Add about 1 cup of the whipped cream into the custard mixture and stir well, eliminating any lumps. Then transfer this mixture back into the rest of the whipped cream, and fold gently until the mixture is smooth. 12. Use a serrated bread knife in a long, back-and-forth sawing motion to cut the brioche disk(s) in half horizontally. Pipe with a pastry bag and tip or spread the diplomat cream onto the bottom disk, leaving more in the center than on the sides. Place the second disk on top, and press slightly. Refrigerate the tart for 1 hour, and then cut into large slices. Serve with a glass of sweet dessert wine like a Gewürstraminer from Alsace or a Côteaux du Layon from the Loire Valley. Love your stories, history and everything!